Maddy Weber (15) celebrates after the Norse score a point during the contest against Green Bay. 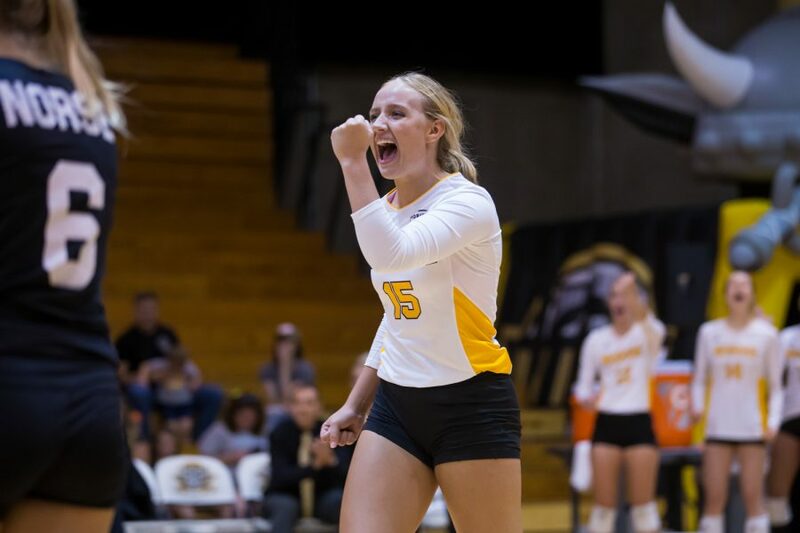 After losing three straight matches, the NKU women’s volleyball team bounced back in dramatic fashion with a sweep over IUPUI (25-21, 25-20, 25-21) and a four-set victory over Wright State (25-21, 25-13, 23-25, 25-13) at Regents Hall over the weekend. With the victories, the Norse move to fourth place in the Horizon League standings, while the Raiders and Jaguars drop to seventh and eighth respectively. Haley Libs led the Norse with a combined 29 kills and 25 digs, notching her fifteenth straight double-double, while Shelby Olsen finished with a combined 43 assists and 24 digs, respectively. The Norse return to action on Wednesday, Oct. 31 as they take on the Penguins from Youngstown State at Regents Hall. First serve is scheduled for 6 p.m. and can be viewed on ESPN3. The game will also feature a Halloween Costume Contest for anyone that wants to participate. The first set of the game was one of the most balanced offensive games that the Norse have had this season thanks to Olsen and Miranda Wucherer. Their sets allowed the Norse to have 17 kills on 30 attempts, while the defense had several players register three digs apiece. The Jaguars came out strong during the start of the second set, but two runs allowed the Norse to pull ahead at 19-13. They maintained this lead throughout the rest of the set. Western led the Norse offense with five kills followed by Libs and Brinkmann with four kills. The third set resulted in a large number of errors for both teams; however the Norse did not let this stop them from finishing the final set to win the match. Libs led the Norse offense and defense with five kills and eight digs, while Olsen and Terrill also led the Norse defense with eight and seven digs respectively. The first set of the match was even throughout most of the set. By the end, the Norse defense stepped it up an extra notch by gaining back-to-back blocks from Natalie Hardig and Laura Crawford to get the Norse up to set point before Libs finished the set with a kill. The Norse killed it in serves during the second set by gaining five aces between Wucherer, Libs, Terrill, and Olsen. The Norse offense also excelled with Crawford leading the way with four kills. She was followed closely by Libs, Brinkmann, Western, and Wucherer with three apiece. The third set started with the Raiders holding a 4-0 lead before head coach Liz Hart called a timeout. After the timeout, the Norse recovered to knot the game at 5. From there, the points were back and forth before the Raiders took another lead that ultimately led to their two point win over the Norse. Both teams came out ready to play during the final set. The energy was high, and the two teams kept a pretty even playing field before Brinkmann went on a serving run to give the Norse a 12-8 lead. The Norse maintained a good distance ahead of the Raiders the rest of the match before finishing the set, 25-19. Sunday’s game also doubled as the Pink Game for breast cancer awareness. The Norse played this match in honor of freshman Miranda Wucherer and her mother who passed away from breast cancer.